'Click chemistry' was defined by Sharpless and co-workers in 2001 (1) to describe a set of powerful, highly reliable and selective organic reactions which can be used for the rapid and facile synthesis of useful new compounds and combinatorial libraries. Each of these compounds is composed of small, modular sub-units stiched together through heteroatom linkages (C-X-C). Click chemistry reactions are simple, modular, stereospecific, very high yielding, wide in scope, can be conducted in benign/easily removable solvents, and generate side products which are easily removable by non-chromatographic methods. The primary driving force behind the development of click chemistry is the pharmaceutical industry's need to generate very large combinatorial libraries of small-molecule (< 500 Dalton) compounds that can be screened as drug candidates. Click chemistry has the potential to accelerate the drug discovery process, as it makes each reaction in the multi-step synthesis of a small molecule fast, efficient and predictable. 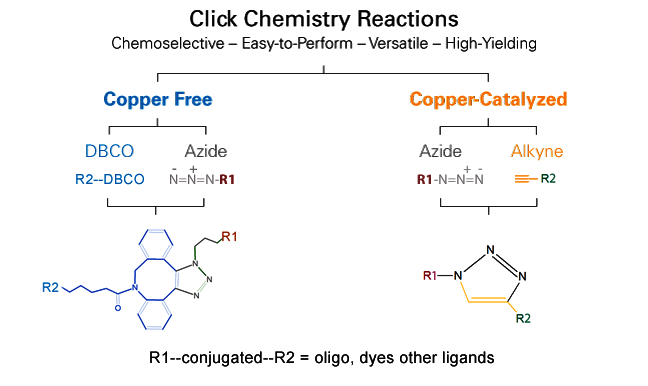 Although there are several types of organic reactions that fit the definition of click chemistry, for modification of oligonucleotides, the relevant one is the copper(I)-catalyzed [3+2] cycloaddition reaction between alkynes and azides (1,2). This reaction is extremely selective and regiospecific for conjugation reactions involving an oligo and a labeling moiety, as well as coupling reactions between two oligos. More detailed descriptions of specific click chemistry applications are provided in 'Click Chemistry Applications'.